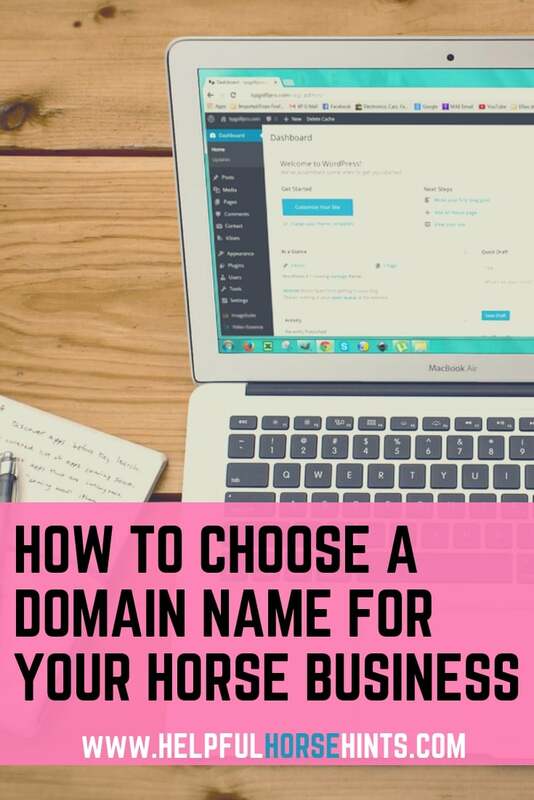 Choosing a domain name is one of the most important things you can do when creating your website. It needs to be something thoughtful, descriptive and easy to remember. There are several things to consider when choosing a domain name. 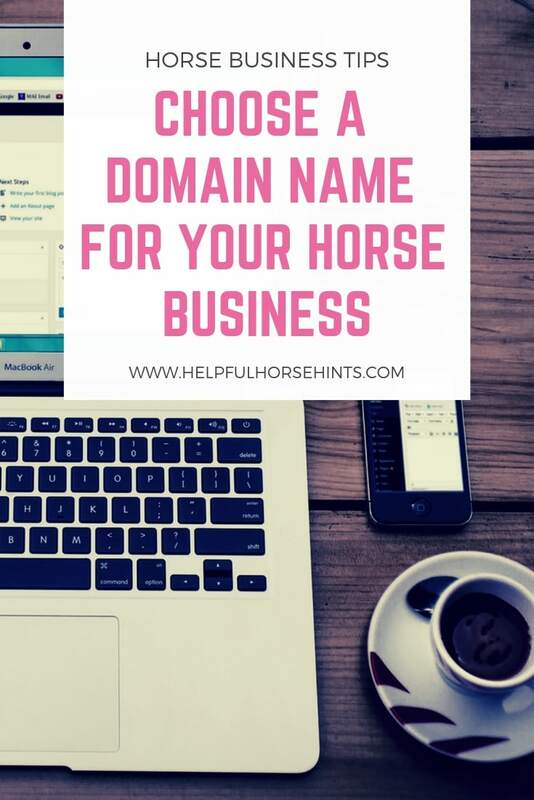 If you have a ranch name and the .com is available, you should use that for your domain name. Same goes if you are a trainer, farrier, etc. You can work on branding, seo optimization and brand recognition later but if you have an existing farm or ranch name, really try to use that. If your ranch name is difficult to spell or very long, you should also consider an alternative. I once had a ranch called “Equine Acquisitions” where I specialized in rehabbing and then reselling auction horses. This became a nightmare as far as giving the web address or my email address out. Some people were OK with the word “Equine” as long as they were in the horse community but boy, I did not realize that “Acquisitions” was such a hard word for people to spell. I later changed the name to “Family Horses” which was much easier to relay over the phone. If your ranch has a non-traditional spelling, consider purchasing two domains. One spelled YOUR way, and one spelled the traditional way. For example, if your ranch is “Fyre Storm Ranch”, I highly recommend purchasing both “FyreStormRanch.com” as well as “FireStormRanch.com”. I recommend A2 because I have used them at work and we like them. The setup isn’t as easy as BlueHost but it is pretty close AND they offer 1-month payment up front instead of a minimum of 1 year. They also run various specials throughout the year like Black Friday Specials. Keep in mind this option, paying one month at a time instead of annually, does wind up being more expensive in the long run. It also doesn’t include the domain name but, if you are on a budget, it is a good option. Don’t worry. I won’t judge though. I’ve been in a situation where I just COULD NOT afford to pay for several months worth of a product or service to get a discount. That’s OK. We don’t judge here. The good thing is you are getting started! If you need more help finding the monthly price vs paying 1 year up front, use this step by step guide on setting up A-2 Hosting. So you have had your ranch name for years or have found the perfect domain but, the .com is available. What should you do? That depends on what is going on with the .com. When I decided to change my business/domain from EquineAcquisitions.com to FamilyHorses, I soon found that FamilyHorses.com was taken. BUT!! the good news is that it was bought by a domain reselling company. I reached out to them to see how much they wanted for the domain because I knew it was best to have a .com. Much to my surprise, they wanted almost $3,000 for it!! That’s right, for only $3k I could own FamilyHorses.com. The decision there was easy…I loved the name so I bought FamilyHorses.net. 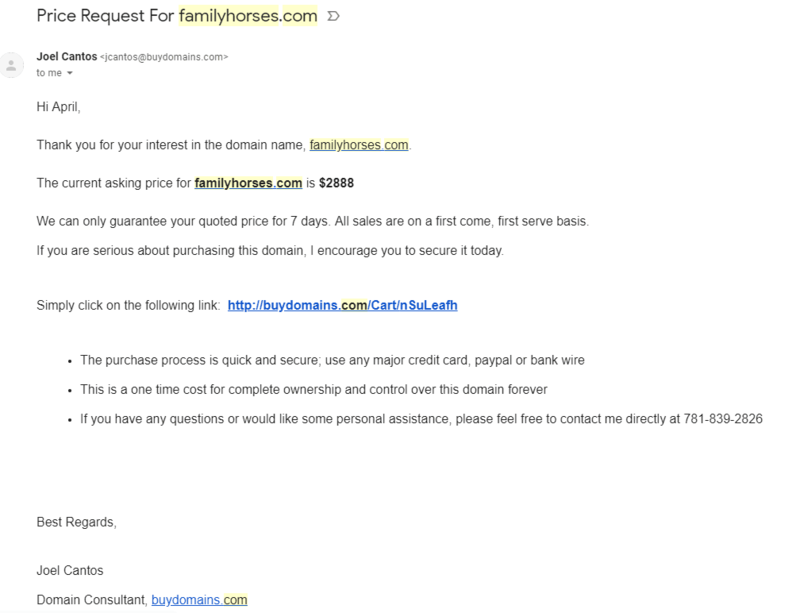 I knew the chances of someone paying $3k for that domain in the horse industry was probably not very likely. I also knew that by the time somebody did so, I’d have enough time to build up my own brand so it wouldn’t matter. To this day nobody has purchased the .com. I politely declined. I knew there was nobody in the industry with the same name and I knew a startup business wasn’t going to invest that much in a domain. So What Do You Do if Your Domain Name is Taken? Need more help with defining your domain name, think about what someone would type into a search engine to find you? Maybe you specialize in horse boarding. In that case, they may type in horse boarding city/state or “Dancing Dreams Horse Boarding”. In that case, you could see if “DancingDreamsHorseBoarding.com” was available. These are some great domain name generators you can use to help you find the perfect domain. They are all free! There are others available on the web as well. https://instantdomainsearch.com/domain/generator – Domain name wasn’t available, this generator will add words before and after to give you ideas! https://www.namemesh.com/domain-name-search/ – This one is really nice because it will exclude domains that are already taken. https://www.leandomainsearch.com/ – This is one of my favorites…again it adds stuff before and after like the first site but the layout is easier to read. The hosts I recommend all offer a FREE domain name when you sign up for a hosting account. This is the way I recommend you purchase your .com. However, I ALSO recommend you, at a minimum, purchase the .net and, depending on your budget, other extensions as well (like .org, .biz). Those won’t typically be the domain you give out to prospective customers but, we can set them up to redirect to your main website. In addition, you can make sure they don’t get snapped up by a competitor wanting to use the same name.